Cadbury Dairy Milk chocolate block with a smooth flowing caramel centre. 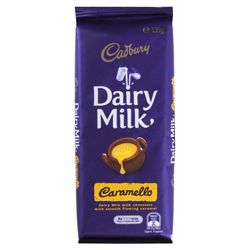 Cadbury Caramello King Size may be manufactured in either Australia or New Zealand. Milk Chocolate contains Cocoa Solids 26%, Milk Solids minimum 24%.